Subject: "Selection of restorers for the intervention of selection of rubbles and frescoes fragments of the #SanBenedetto Basilica in #Norcia and the Church of #SanSalvatore in #CampidiNorcia. 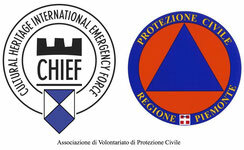 The National Department of Civil Protection, the General Secretary of the Ministry of Cultural Heritage and the Umbria coordination of UCCR, asked CHIEF to deploy its volunteers in the delicate above mentioned operations from July to August 2017. CHIEF decided to accept the request, since the decrease of the seismic activity and the conclusion of the securing activity at the two sites, thus meaning the volunteers could be working in a safe environment. Their effort could be a tangible contribution for the communities of Norcia and the whole region Umbria.